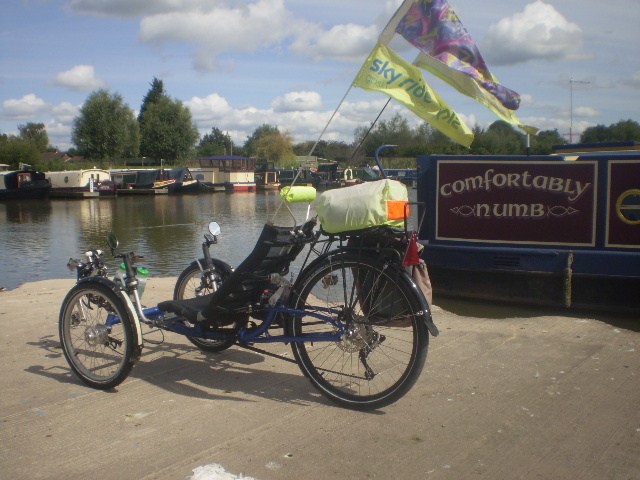 Alonzo Savage, enthusiastic Trike Asylum reader, finds his home in Great Britain, and, perhaps not surprisingly, rides a trike created by Inspired Cycle Engineering, the ICE T, also from the English domain. 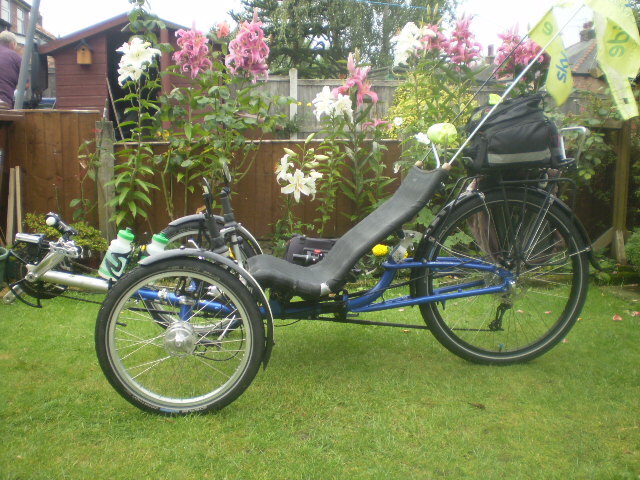 Below are a few photos of Alonzo, his trike, and some of the modifications and additions he has performed. Alonzo is a creative fellow, adapting his Trusty T as necessary. Click HERE to visit his Alfa Side Pod page. My name is Alonzo, full posh title, Alonzo L Savage Bsc.hons, but no I’m not Spanish or Italian; I was born and raised in Preston, Lancashire. Now, I’m a retired teacher and a recycled teenager. 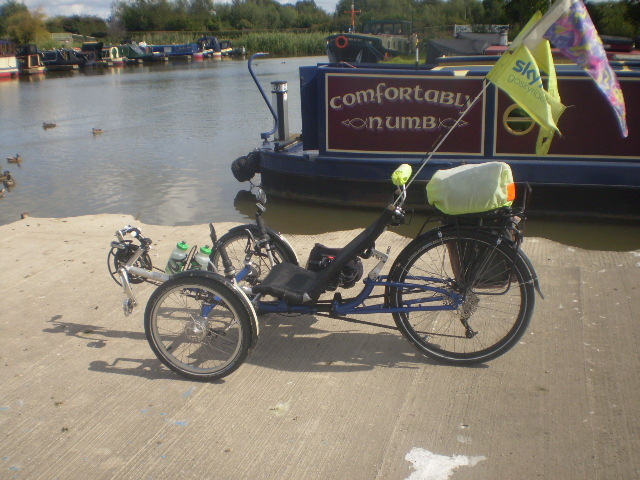 For the last five years plus I’ve been piloting a recumbent tadpole trike and it’s way better than a hard saddle that can be found on most bicycles. 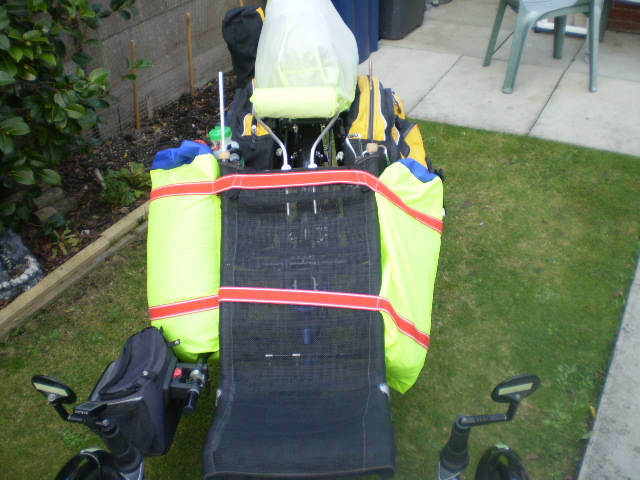 I started riding a recumbent trike about twelve months after having my cancerous prostate removed. I’d previously done a 30 mile charity ride for a local cancer charity on my bicycle. When I got to the finish I was sore and completely shattered. My legs ached, my arms and neck ached and my nether region was complaining bitterly. 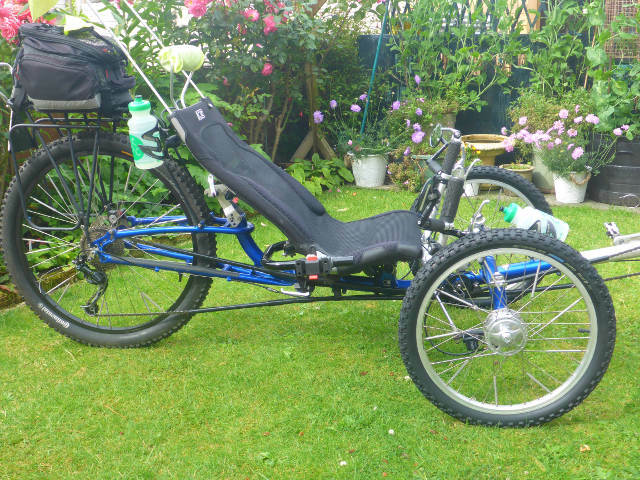 Now, I can’t recall how it first came about but I’d looked at recumbent trikes and test ridden a few but was concerned with the low stance of these machines although they were sooo comfortable to ride. I did a lot of research on the net and read about peoples worries which it has been proved beyond doubt are groundless. ”Your too low down, you won’t be seen by cars”. Well that’s easily answered; down the centre of the road is a white line and I’m not lower than that. 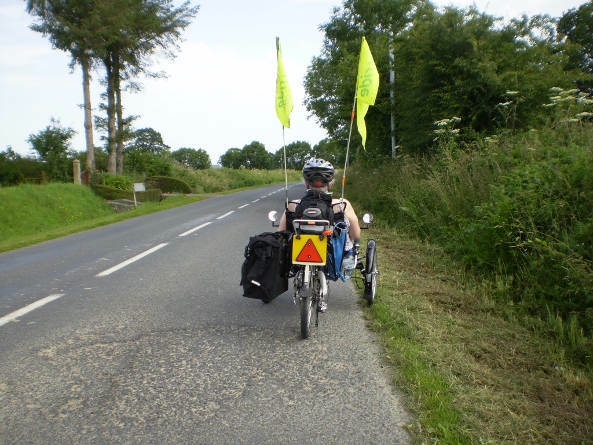 Plus I have two large flags on the back of my trike that are well within any vehicle drivers eye line. After the first few, admittedly tentative rides, all my doubts disappeared and I now always get more room from drivers than I ever did on my bicycle. 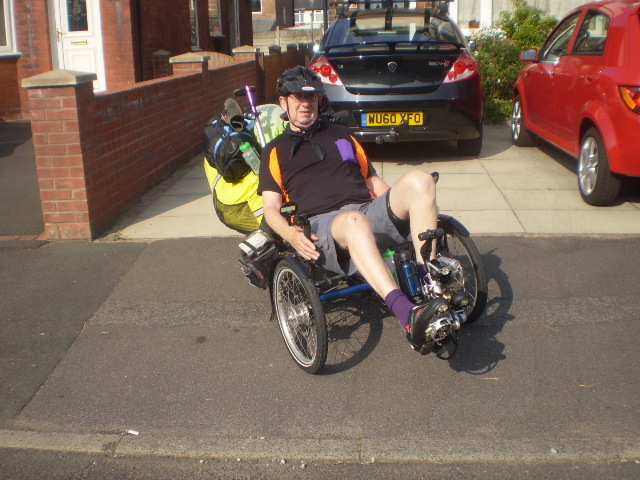 Added to that just two years after buying the trike I again rode for that same cancer charity, again thirty miles over very similar terrain, this time from Blackpool North pier to the Eric Morecambe stature the other side of Lancaster. At the finish I was hardly even out of breath and I certainly didn’t have any aches. The proof of the pudding etc. I have now started keeping up with, via the net, an American triker named Steve Greene. His website, and for that matter, his books are something to behold as is Steve’s outlook on life in general. For Steve’s full story go to ‘Trike Asylum’ and have a read. My cousin Jaqueline says that I have always been a bit of a rebel, not quite sure what she means by that, but I guess I do go in for what might be classed as alternative ways of doing things. Not content with just fastening planks of wood together to make a trolley as a kid I had to affix an old cement mixer engine on the back and a pram handle on the front axle for steerage, in effect the first go-kart in the UK. My mum drove it into a hedge down the lane at my uncle’s market garden. I suppose she was the inspiration for many of my antics though dad had a hand in the engineering bits. Dad was arty and had served in REME (Royal electrical and mechanical engineers) during WW2 and my mum was a very creative seamstress. So my upbringing was one of art, design and creativeness. Thus as a teenager I wanted to be an Art teacher but instead spent many years doing office and stores work. All my spare time I was drawing, painting and making things. Then at the age of 47 came redundancy, but being the rebel I guess I am I studied to get myself a degree and spent twelve happy years teaching Design Technology and Art. 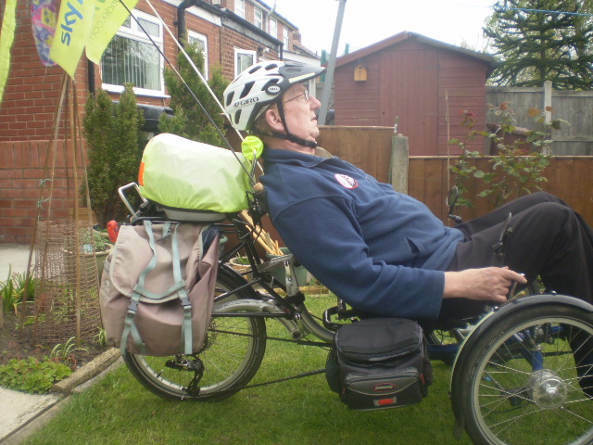 Near the end of my teaching career I would arrive at school on my recumbent trike much to the excitement of the students who thought it really cool and to the amazement of the staff who thought I was crazy. That though, whilst giving you a rough outline of me, is a whole other story. 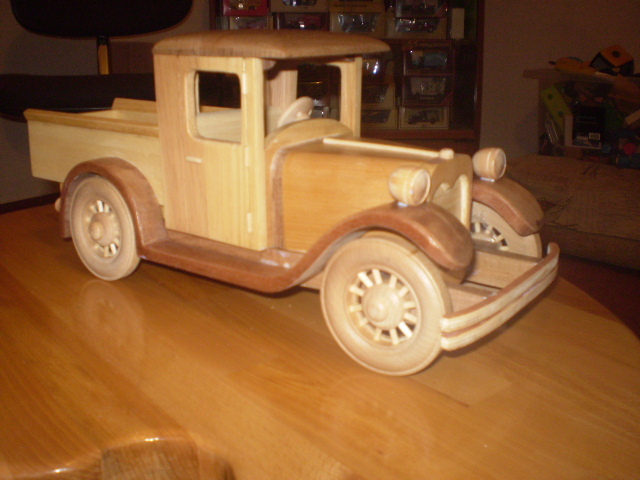 My retirement from teaching in 2009 signalled the beginning of my new life, one of making wooden toys for my beloved grandsons, riding my trike as often as I wished but mostly in fine weather and being of more help to my wife who is still working part time as I write this. My wife used to ride a bicycle and follow me behind the trike. She tells folks that she’s quite convinced that drivers think I’m disabled as they give me priority at roundabouts and junctions when they actually have right of way. They also give me plenty of room when overtaking. After all, which driver wants to crash into a disabled rider aside from that numpty off Top Gear. I do however ride courteously moving over when possible to allow traffic to pass when the road narrows or street furniture looms in the middle of the road. 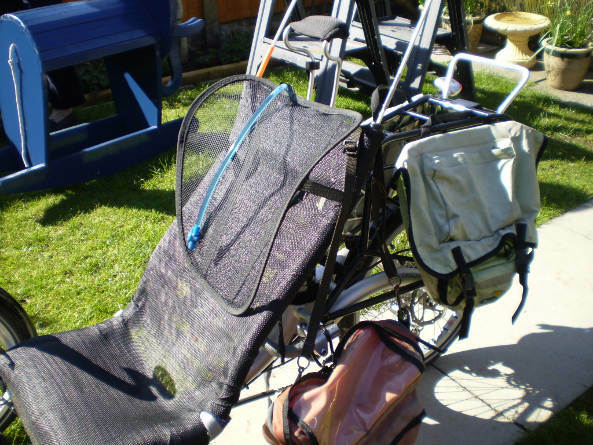 So the making part of my life has never stopped and now that my wife also has a trike I’ve passed my time making various items that make triking easier. I searched the net for a stand suitable to do mechanical work on our machines. 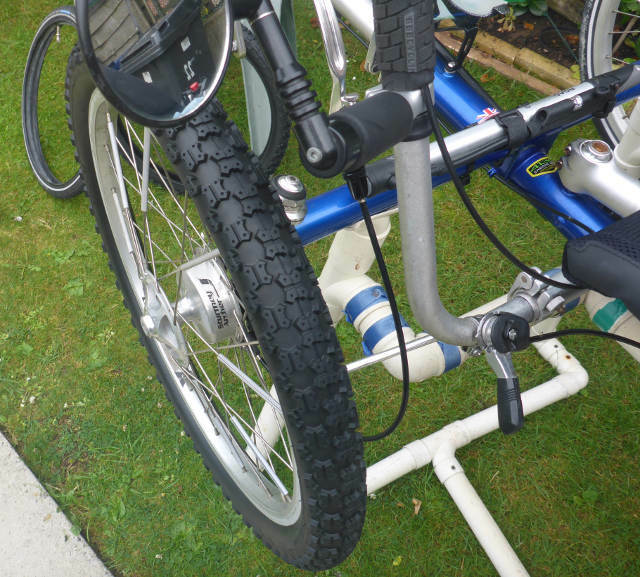 I found plans for several versions designed for trikes of makes other than my own and simply adapted them to fit. 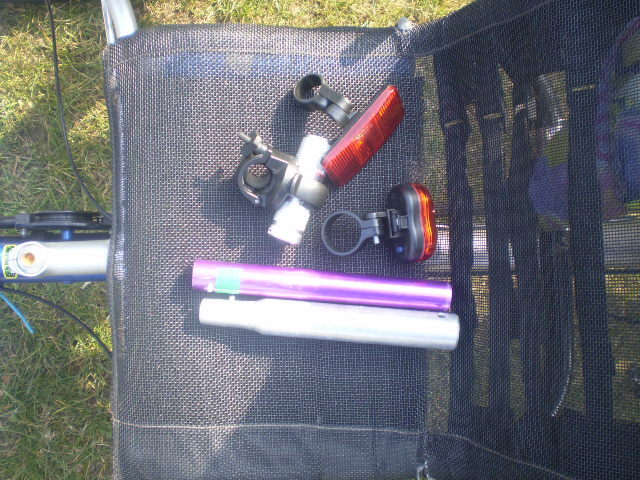 On the Trike Asylum site one rider sent in plans for a mini/travelling stand and I now have one of those. 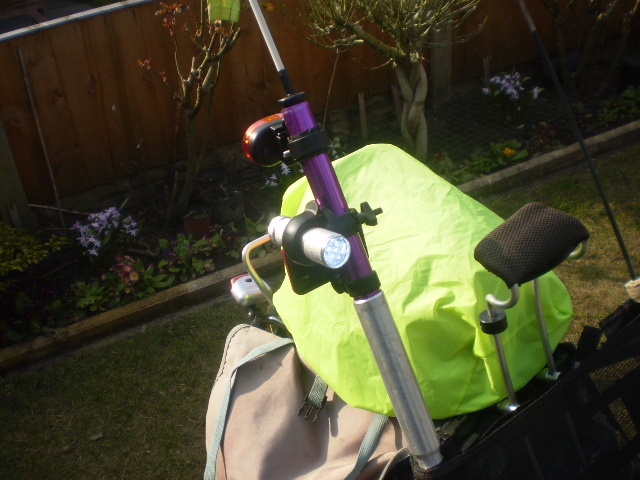 Steve Greene paid a welder to make a lifting handle for his ICE ‘Qnt’ trike. I made my own for my ICE ‘T’ for about a tenth of the cost. Who the heck is ICE? 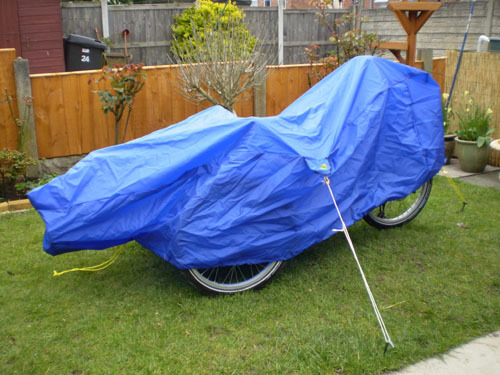 OK let’s put the record straight, ICE or Inspired Cycle Engineering are English manufacturers of the best trikes that money can buy, the BMW , some say, of the trike world. They manufacture several models and variations thereof. The best way, rather than me quoting brochure details is to look on their website yourself. The prices are high for a full spec’ model but no more so than a top quality bicycle. The only difference is the comfort level of the trike. 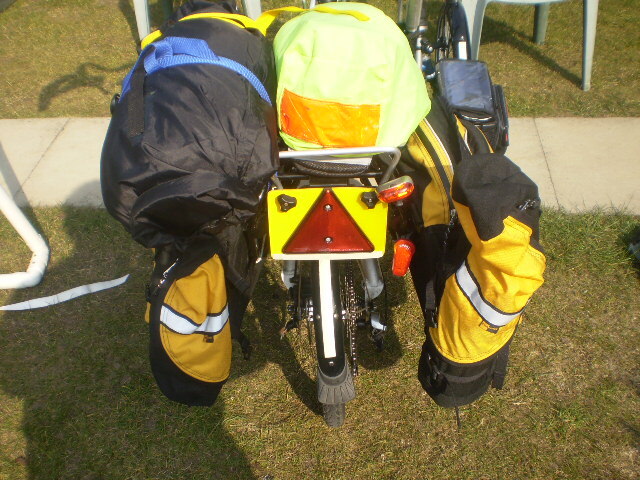 Having tried trike camping I can now verify that Arkel panniers are excellent and the RT60’s that I have are designed specifically for recumbent trikes. 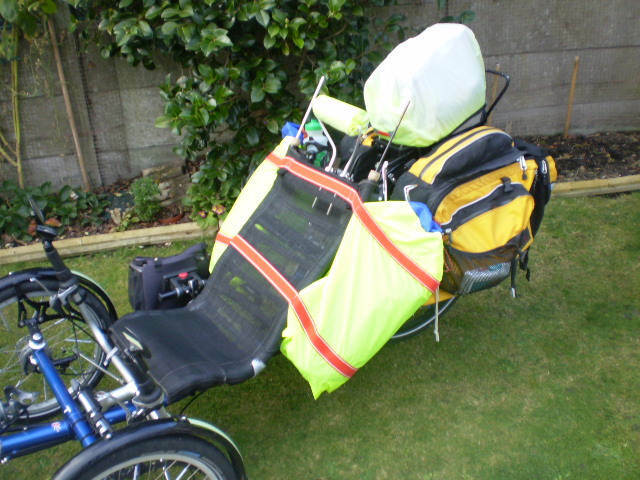 Steve Greene uses the T54 version that also fits the standard bike but he also adds the Radical side pod bags that fit either side next to his recumbent s seat (see website). 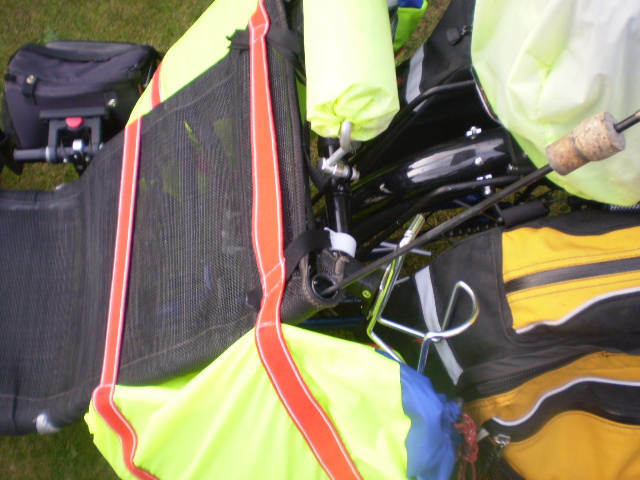 There’s lots of stuff on Steve’s site that will help and advise new recumbent riders. 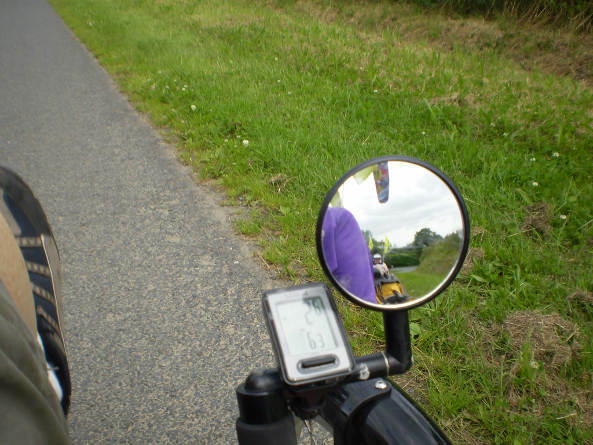 Looking back through my trike logbook in which I record all my rides I notice that most of my trips are quite short distances in comparison to many cyclists. 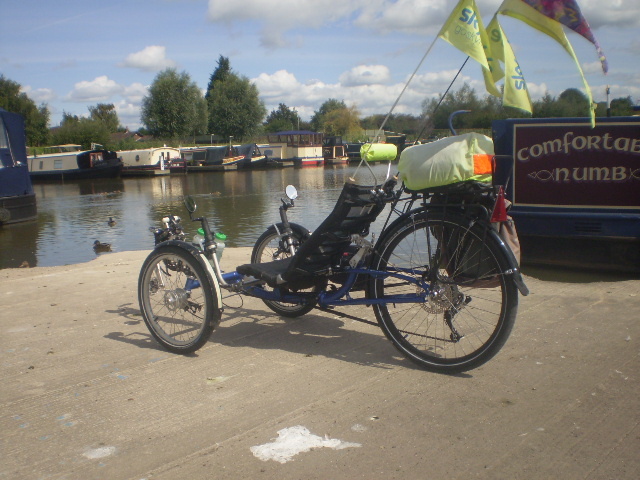 I use my trike regularly to travel into the city of Preston and depending upon where I’m headed that can be a ride of 12 to 20 miles. It is much better than getting my car out, less pollution. 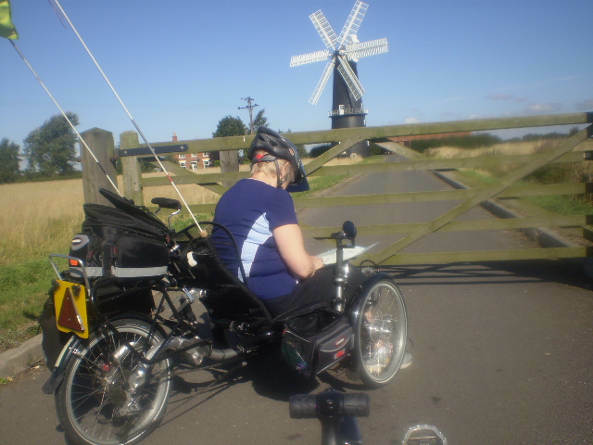 Many of my rides have been in the company of my wife who just after I first got my trike had kidney failure and as a result cannot ride more than about 40 miles at one go. 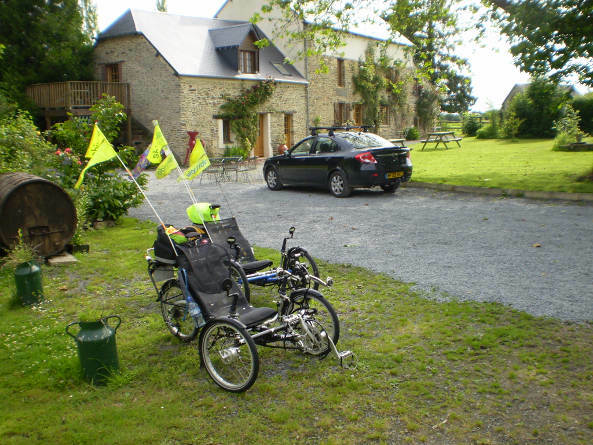 Although we take our trikes on holiday to France we plan our rides there to be of a suitable distance for Margaret. 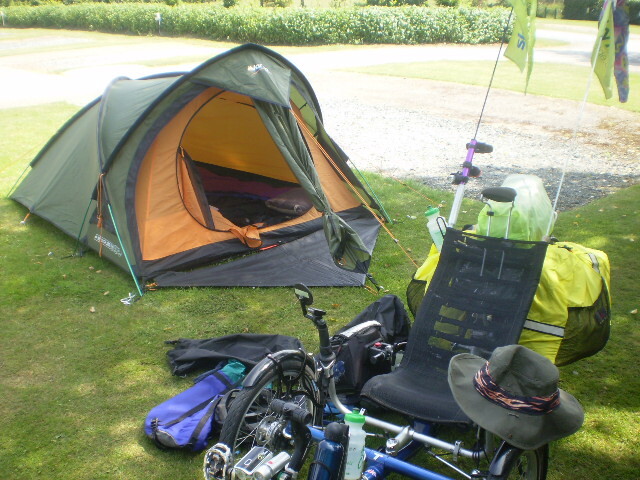 Two years ago I planned a trike route around Brittany and over into Normandy with the intention of staying each night in a B&B having covered a shortish distance (no more than 35 miles) each day. This would give us plenty of time to sightsee and enjoy the experience of the country. Unfortunately, about three months before our trip our doctor suggested to me that such a trip might jeopardise Margaret’s health. Well there’s no point ignoring a doctors advice so we modified the plan took the car and stayed at three bases for several days. It was a good job too as the terrain was far hillier than the map suggested and one ride in particular left my wife very very tired. She’s too important to me to put her at risk. The holiday overall though was a success and we used our car very little other than to transport the trike from one base to another. I know my rides are piddling short compared to many but it must be remembered that we live on a small very picturesque island and as a result we need only travel a very short distance to be in the countryside or by the seashore. We have become happy to travel at a slower pace since we now both have trikes. I can and do go on some quicker rides when my cousin is home and he accompanies me on his road bike. We often zip out to local cycle cafés for a brew and a bite to eat and my trike attracts a lot of attention but the idea of doing sixty or more miles a day on cycle club rides holds no appeal for me. The Arkel RT-60 bags form Alonzo’s base cargo solution. Keeping the T covered in rain on overland journeys helps reduce potential rust. 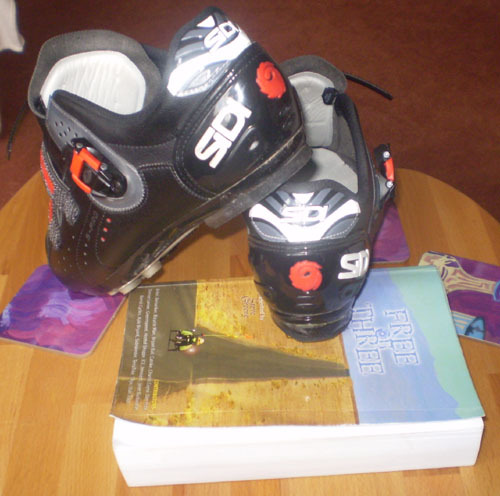 Alonzo wears the best shoes, and reads some great books. Alonzo’s wife also rides an ICE trike, seen here just outside Boston. How come there’s a windmill just outside Boston? The answer of course is that this Boston is in Lincolnshire over here in England. The photo shows my wife studying a map whilst waiting for the Sibsey mill to open to visitors. 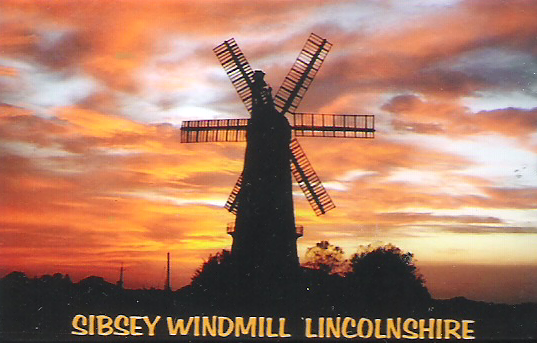 We went off for a few days break to Lincolnshire last year and whilst the roads are very flat the easterly wind or any direction wind howls across the open fenland making riding easy one way only. One ride was another ‘It’s a small world’ scenario. We met a young chap riding a bike and he lived in Guildford, where my wife’s cousin lives and he quite often came north to our neck of the woods because his girlfriend lives just three miles from our home. She also went to school in Chorley and I used to teach at a school in Chorley. I gave him my card but he never did contact us to say if she went to St Michael’s High School. Here is the answer: This Boston is not in the USA. Leaving the car in England near the departure point and pedaling through to Jan and Dave’s at Benouis from St Malo, about 18 miles and staying there for five nights. Then cycling to the Manche peninsular and over to Ouisterham in Normandy over the next ten or maybe twelve days. The plan at this stage is not hard and fast as we need to sort accomodation. If it was just me maybe I’d take my tent and risk finding a camp-site each night. That’s not an option with M. She wont manage much more than 30 miles each day and a pre-booked stop is vital. After her kidney problems I can’t take any risks. 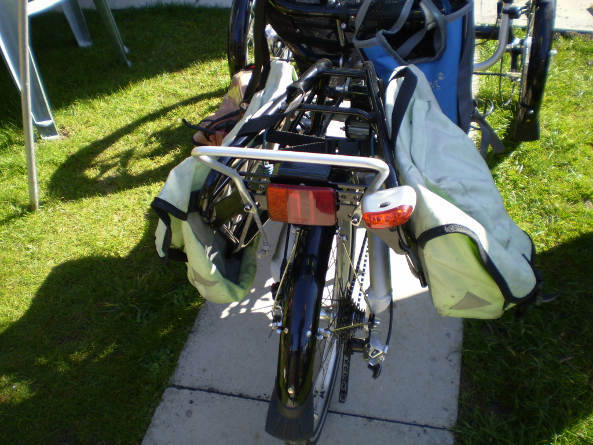 I’ll most likely take the bulk of the luggage in my Arkel panniers and M can use my old bags to carry some of her kit. 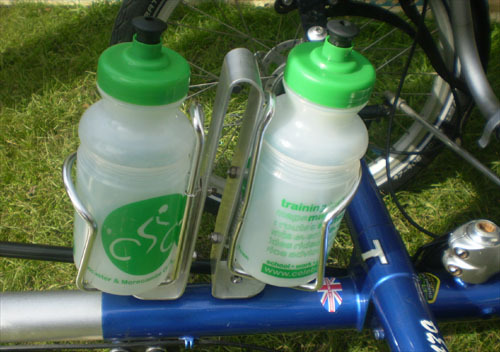 She’ll be loaded up with a water sack and bottles to keep her liquid intake up to well over 3 litres each day. It was a lovely idea but perhaps from the outset too ambitious. This proved to be the case when in mid March Dr. Atkinson expressed concerns that Margaret’s health might not stand up to the strain. Well there’s no point asking a doctors view and then ignoring it is there? 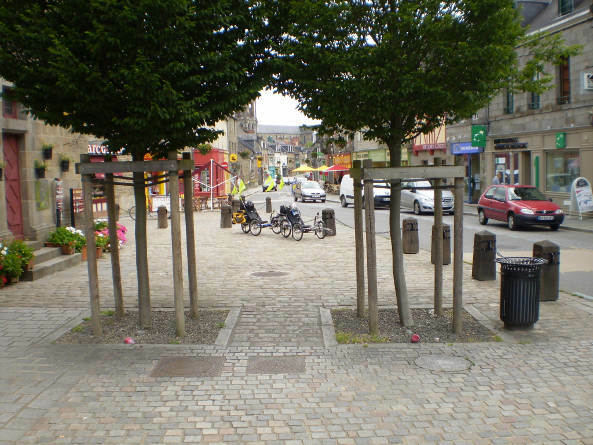 So it’s decided: we will take the car over to St Malo and spend 5 days with Jan and Dave at Benouis then move on. We will maybe visit the places we had originally planned to stop at just to check them out. We will stay 4 days at Lamberville then move on again and stay the final 4 days at the Cider Farm near Carenten. The plan being to cycle ride from these three bases doing maybe 15/20 miles each day but knowing all the time that we can turn around and go back to the car, so much safer. This revised plan also allows us to take more kit with us which gives Margaret more comfort with regards to clothes and such like. The trikes are working OK and I’m slowly setting them up the way we want them. Margaret’s now has a ‘springy seat back rest’ (from AFL), which we’ve moved around to get the best position. 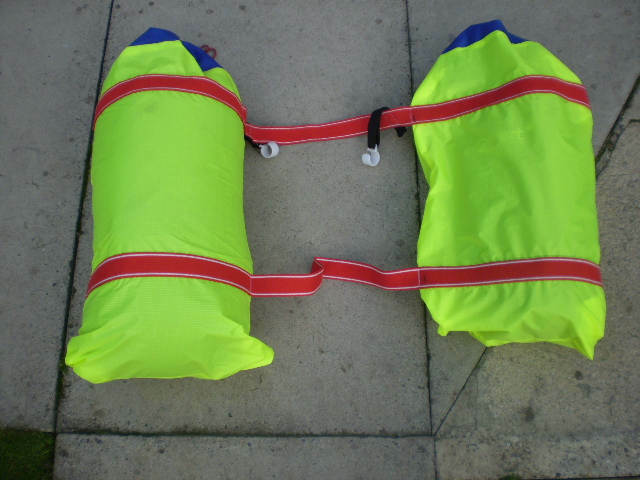 This replaces the foam wedge cushion that tended to get wet and take ages to dry. She’s also using a Camelback style water bladder fixed behind her seat. 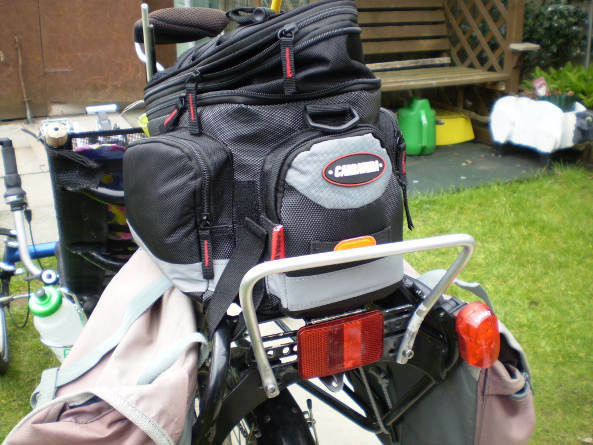 The side mounted bar bag is just about OK but my Carradice rear rack bag is brilliant. 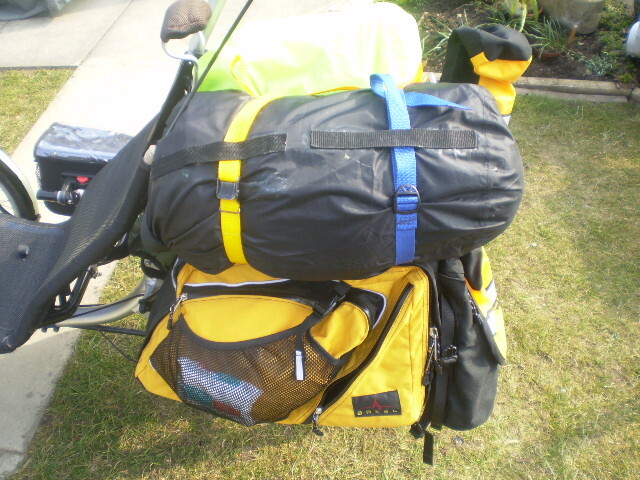 Carradice bag takes my wet gear and some of my extensive tool kit which include several spare inner tubes. 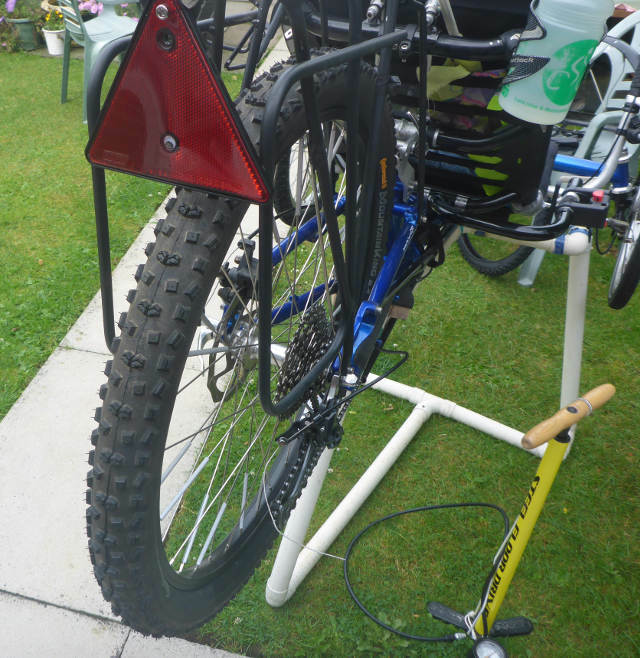 We’ve made a prototype trike cover and fashioned a rear rack lifting handle, see photo’s, made from alloy bar for each trike. This makes lifting and turning the machine so much easier than putting a hand under the rack. Above: springy seatback and you can also see the ‘camelbac’ drinking tube added for M’s water intake of 3Lt + per day after her kindeys failed. 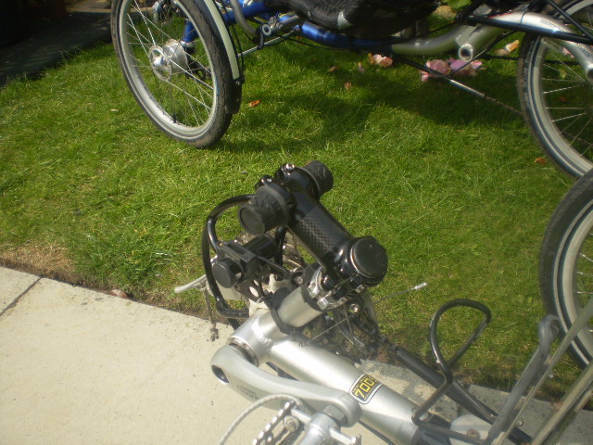 I tried using the same toe-strap and bungee cord pedal set up as on M’s trike but have since swapped back to cleats which I’ll need to fiddle with to try to get rid of the pressure on my feet after long rides. The next thing to get right is mounting M’s trike on the bike rack at the rear of the car. On our way to a weeks holiday in Weymouth we called in at Smiths cycles in Kidderminster. Andrew there has an ICE Sprint that he’s fitted with electric power assist. He uses a Chineese Bafang motor together with all the electric gismos. We each tried it out on a local car park and it really seems a good idea for M’s trike. The snag is the £800 cost. Still it’s food for thought and needs more research. I have, since we got back off our holiday, also got each of us a rear numberplate in yellow at the centre of which is fixed a red reflective triangle as per numberplate trailer boards. 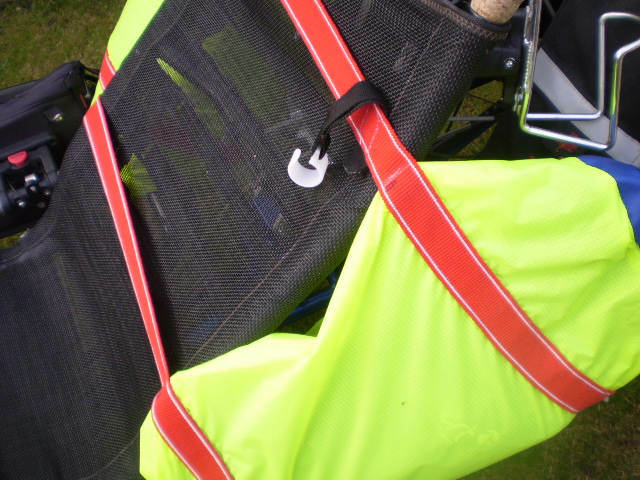 The numberplate is fastened to the back of the rear rack. 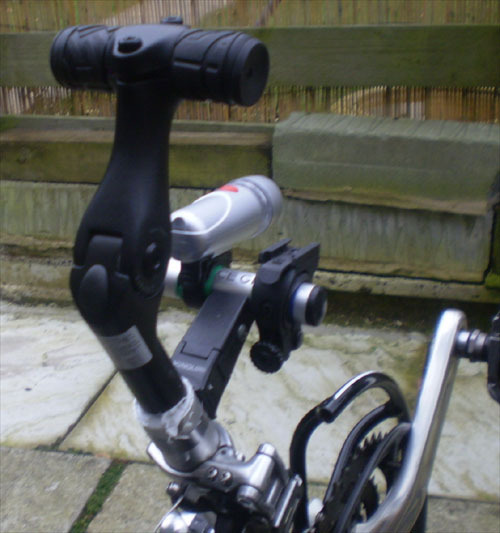 As a result of this the rear handle is fixed to the inside face of the rear rack. Also I’ve just finished reading ‘The Overland Triker’ by Steve Greene. He’s a crazy guy who rides his trike over many hundreds of miles in the U.S. One of his suggestions is to change the trike gearing for 11-34 cassette and 26-39-52 front rings. 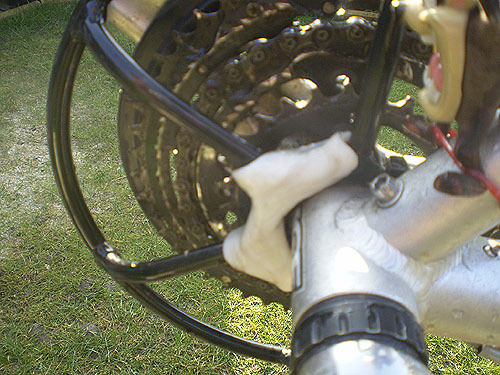 On our trikes we have 9-32 cassettes and 26-36-48 chain-rings. Having looked at a gearing chart there’s not much difference except on the big ring and that just means a slightly slower top speed. 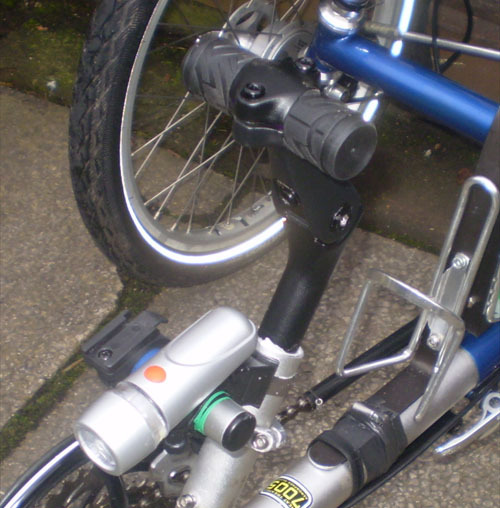 I had planned to change the gearing as it is more cost effective than going electric but there’s no real need. I’ll just have to be happy with slow up-hills from M bless her. N.B. 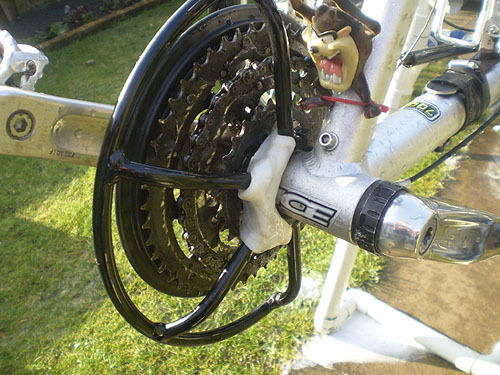 The ICE rear hub is special and would mean a new wheel as well as a new cassette. I’m 66 today a recycled teenager gone wrong? Car loaded and just need to put trikes on in the morning. Looks like we’ll put M’s trike on the back rack upside down. That way we have less overhang around the sides of the car. 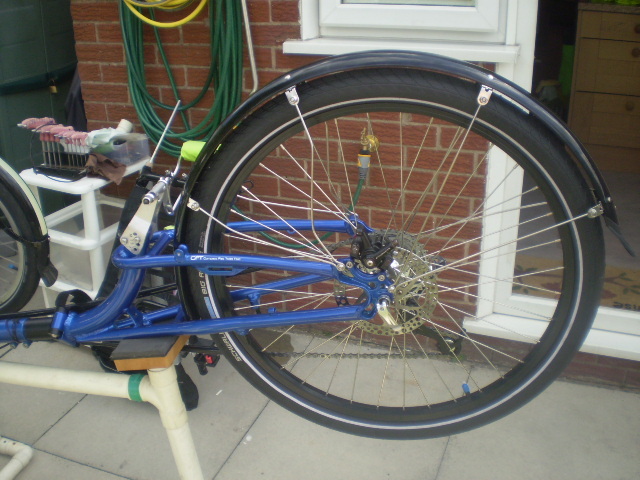 Also with the trike the other way up the centre chain guide-pulley is taking all the pressure and might break. Seat and rack taken off M’s machine and seat taken off mine. 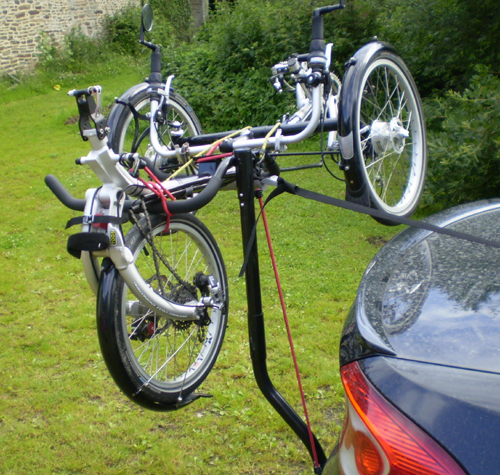 I’ve left the rear rack in place on my trike to aid loading onto the car’s roofrack. Need to sort tyre pressures when we get to France. I plan to change the trikes’ cassettes when we return to 11/34 to give M better climbing although she thinks it’s just lack of energy on her part. Well the hol’s are over and we are home. What a ‘different’ holiday it’s been. We arrived at Benouis as planned on 22-6-12 and stayed with Jan and David for five nights. It rained and rained and just sometimes it was sunny. It had been wet over there for weeks and work on the end gite had been hindered more than somewhat. Michael the builder and David had done the digging out and whilst we were there they got the floor concreted. The base for the shed had also been put down but work on the gite floor took priority so I didn’t get chance to help put up the shed as planned. 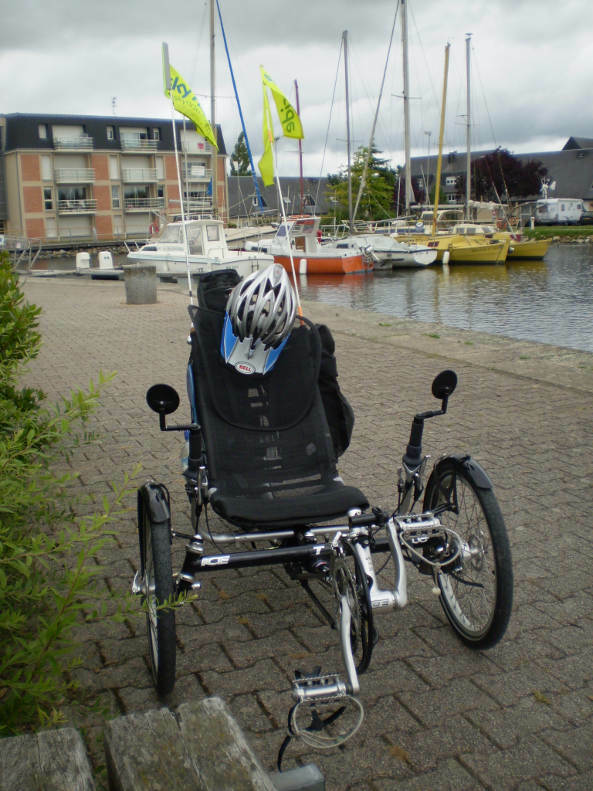 A really strange thing happened when Margaret and I went for a trike ride to Combourg. We’d followed our map to what was supposed to be a cross roads. Hang on, let me back track a few weeks to our family gathering when my cousin Jackie mentioned that she’d seen a tandem trike on a visit to Scorton near Garstang. It was ridden by an old chap with a white beard and his wife…without a beard. ‘Yes’, I said there were such trikes around but they are rare. OK back to our ride and we are lost as the road opposite wasn’t there. This happens in France were roads/road numbers and maps tend not to always match up. We got together for a closer look at the map but still couldn’t figure it out. All this in the middle of nowhere, lost in France!!!! Very strange. We did do some other rides from our other two bases but my memory is only stretchy except for recalling that it was hilly and Margaret struggled quite severely on one of our rides. Oh! And on a ride around Caranten we’d parked the car for longer than we should by the harbour in parking slots outlined in blue. There were no signs to tell us that waiting was limited just an angry local resident who came over waving his arms about. 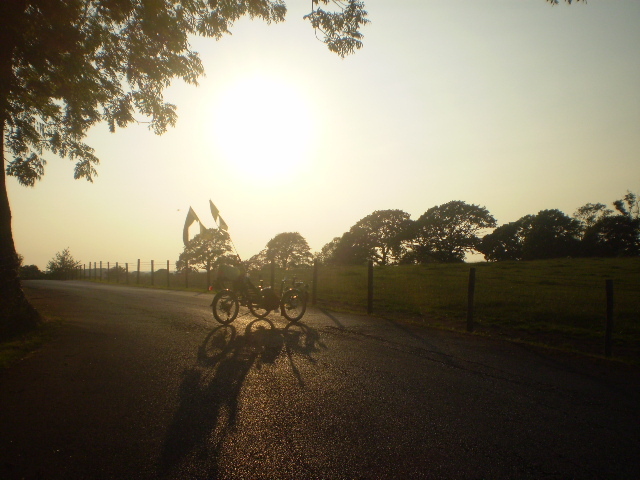 Still we’d had a decent little trike around that day on for once flattish terrain. 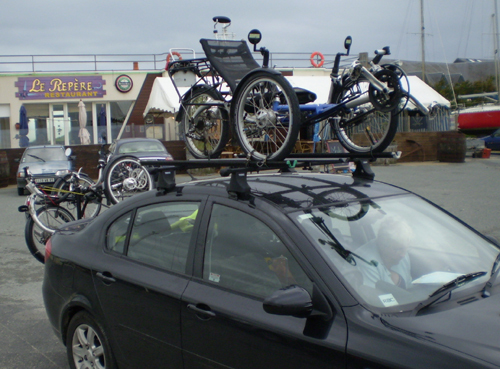 We loaded the trikes and headed back to our base then home the next day on the ferry from Cherbourg. Just back from another local saunter with my wife and as I had my camera handy I took some snaps of my head/neckrest. 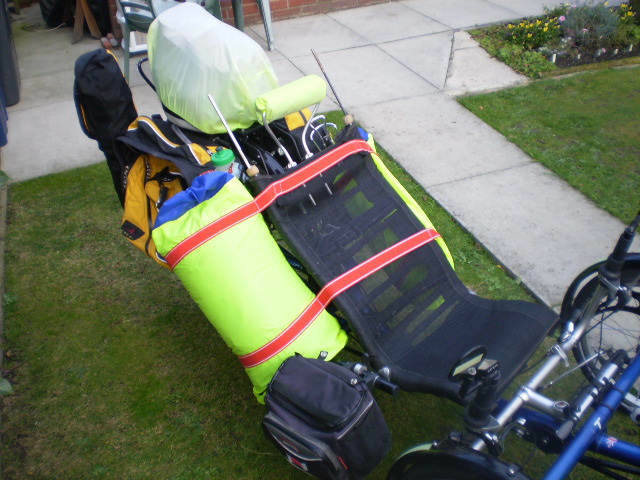 Also some pics of recent attempts to lighten the load on the trikes. 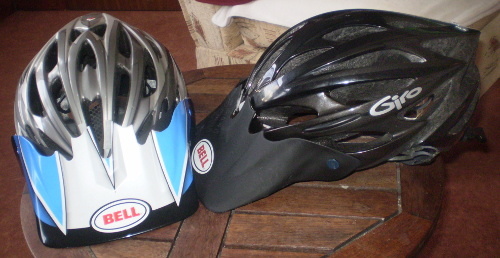 I can’t ride on our rough roads with my head on the neckrest but can use it on the occasional smoother bits of tarmac. Only snag is it’s so comfy that I want to close my eyes and doze off. I’ve swapped the adjustable stems for shorter standard ones that fit around the front changer post. WE now carry 5 ounces instead of 1lb 5oz. 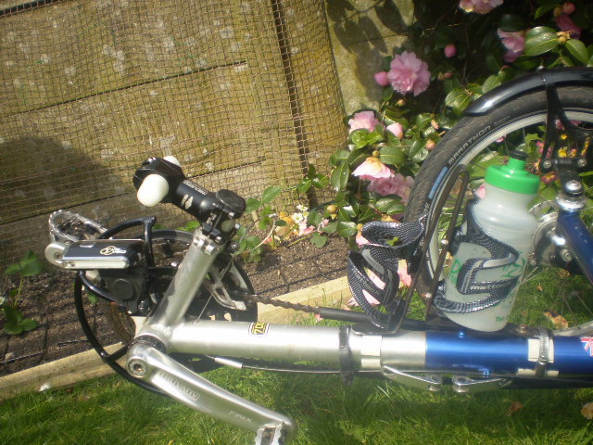 I’ve also fit carbon bottle cages to my machine and am waiting for two more for Margaret’s trike. The weight saving is marginal but every little helps. My hip is causing me some pain but I have managed 15 or so miles each day for the last three and hope to continue in this way if the weather stays fine. T26 specifications:- ICE model T with 20″ front wheels, 26″ rear wheel, Schwalbe Big Apple tyre run at 55psi to compensate for the lack now of rear suspension, 11 – 34 cassette and 24, 39, 48 chainrings. I’ve been out some more on my T26, in fact on Friday I pedalled to Southport a seaside resort some 17 miles from our home. The weather was fine with a suggestion of sunshine and the road actually includes some halfway decent cycle tracks. The new set up is definitely quicker and without too much effort I covered the miles to Southport at an average of ten mph as against my usual 8.5 or 10 if I really pushed it. Having made the purchase of a new rain top, cagoule style, I set off to return home. I sauntered through the small town to the shore road and got onto the excellent cycle track. I dawdled along in a dream looking across the Ribble estuary towards the seaside town of Blackpool and beyond to the mountains of the Lake District. I was so distracted by the wonderful view on this now sunny morning that I was quite taken by surprise when a young family of cyclists rode past me. A little further around the coast road I could see the distant Pennine range of hills and had a sense of the magnificence of the area in which I live. Our Island may be tiny compared to yours but it is packed with outstanding beauty just waiting to be explored. As I rounded the end of the shore road I took a left turn onto Ralf’s Wife’s Lane, yes that really is the name of this road that winds through the countryside of mainly agricultural land. I eventually re-joined the busy A49 trunk road outside the small hamlet of Tarleton. I had to use this road for a couple of miles but soon turned right towards Bretherton then left on a quiet road back to home. 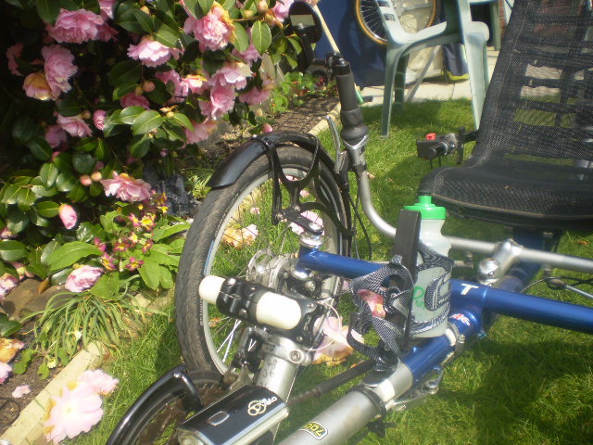 I only rode 39 miles all told but what a fabulous mornings ride on my newly modified trike. My £500 purchase of a new back end is definitely money well spent and there’s a good chance that my wife’s ‘T’ will get the same mod’s before too long. cli Click HERE to read about his side pods.